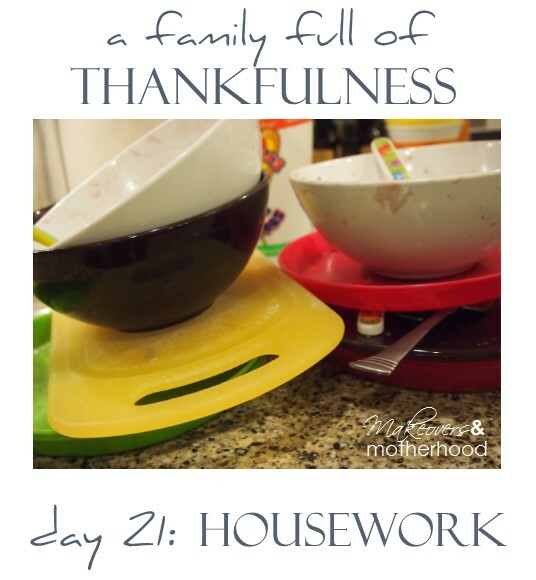 As I’m picking up the house and getting ready for weekend guests, I have to say that I am actually thankful for a messy house housework. I am thankful for beds that need to be made every morning because it means we have a warm home and place to lay our heads every night. I am thankful for dirty dishes and crumbs on the floor because it means my family has a meal. I am thankful for stacks of artwork because it means my boys have been happily working with their hands and using their imaginations to create such masterpieces. I am thankful for the never ending piles of laundry because it means we have clothes to wear. I am thankful we have clean water that runs from our faucets, the bathtub, the washing machine, the outdoor spigots, the water dispenser on the front of the fridge, and even a toilet full of water. It means we don’t have to walk for water. We don’t have to consume filthy, unfiltered water. It comes directly to us so I can fill and refill my boys’ water bottles. I can bath them at the end of the day. I can wash our dishes and clothes, and mop the floors. Yes, while I have a busy day of housework, I am thankful. I am thankful we have the basic necessities of life and have been blessed abundantly over that. And I’m thankful for the mess, the laundry, and handprints on the windows because it means I have a family to care for.